AS THOU OR AS YOU ? The ORTHODOX CHRISTIAN COMMENT brings to the attention of its World readers, and in a particular manner to its English speaking readers and Orthodox Christian worshippers, the anguish and controversy that for many long years has provoked the style and nature of translations from Greek and Slavonic of the Liturgical Texts to the, what we should call, a Liturgical Official English. Great hopes existed, a few years ago, with the setting up of an Archiepiscopal Committee to translate the Divine Liturgy of St. John Chrysostom for the use in the Archdiocese of Thyateira and Great Britain. High names of scholarship were sited in it! Then,... its result became published with the apocalyptic trumpets of the Patriarchal blessing and the drum kit of Oxford University Press...! The scholarship had become contemporary ...! "It had to be accessible to the simple Cypriots," as a leading member of that committee explained then to our Editor. The translation had its critics from multiple angles. And it was heard that a committee member resigned from the committee. This resignation was explained at the time, as caused by the adopted tendencies in the committee to parallel the new English language usage by the Roman Catholic, Anglican and other churches. This can be seen objectively in the published translation of the Our Father, amongst others. Therefore, there was no need of English memorable beauty or spirituality! And, of course, following the liberal aggiornamento of Vatican II, let us go with the world of 'Denominations' with a soft theological ambiguity; in this way our venerable hierarchy may assist the ecumenical heat with the refreshing wind from the flow of their top hat's veils. SHOULD WE ADDRESS GOD AS THOU OR AS YOU ? This is part of a wider debate on the accessibility of liturgical language – which in turn raises questions, about the linguistic ‘tension’ between the Church and the world. Forty years ago the case for accessibility was argued in its most extreme form by the Anglican bishop John Robinson. He pleaded for an end "to churchiness and religiosity and everything that sets apart the sanctuary from society." He wanted to see "the decor, the music and the architecture [of the Church] speaking the language of the world it is meant to be transforming." Curiously Robinson did not mention liturgical language in that particular context but his ideas had a big effect on Western liturgical thinking. Altar rails were removed, celebrants adopted the ‘west-facing’ position, and the language of the service books was drastically rewritten. I mention Robinson simply because he helps as a focus. From an Orthodox viewpoint his logic seems very curious. How do you transform the world by conforming to the world’s taste? What would Robinson have said about icons, Orthodox church music, etc? Accessibility on Robinson’s terms would involve the destruction of almost everything that the Orthodox Church holds dear. Although he talked of ‘transforming’ the world he clearly didn’t expect it to be transfigured. For Robinson, accessibility is all about meeting the world on its own terms in order to get one’s message across. A different kind of accessibility is to be found in the BCP (Miles Coverdale) version of the Psalms. Fifteen words, twelve of them with only one syllable, and the rest with only two. This is the shortest version that I know of that particular text, and the most limpid. No ‘message’ here – just a simple, direct appeal from the heart to God, in words that defy improvement. Of course it has aged slightly. We wouldn’t nowadays say ‘Make me a clean heart...’ but does that matter? We all know exactly what it means. We might – but would we want to? Are we not trivializing and secularizing a great text? In particular, ‘thoroughly renew my nature’ is devoid of all spiritual ‘charge’. But it illustrates a point. If we depart too far from linguistic perfection and traditional Christian phraseology do we not tend to defeat our own purpose – ie. by ending up with something which is neither beautiful, memorable nor spiritual, and which doesn’t speak to anyone? Where, therefore, do we draw the line? This brings me finally to the question of Thou v You. In favour of the latter it may be urged that the second person singular is now obsolete – or almost obsolete – even in those contexts which were its last refuge, like school assemblies, RE and English lessons, and most church services. To people under 40 (and certainly under 30) it is therefore apt to sound strange and remote, at least to start with. Even within an Orthodox context God is now often referred to as YOU, especially in books and for purposes of private prayer. Thyateira has already gone ‘contemporary’ and so has OCA. The case for contemporary idiom cannot just be dismissed. Also (an important point): it is getting stronger. Yet the arguments are not all one way. A big limitation of modern English is its lack of grammatical anchorage. This means that certain sentence constructions cannot be used in liturgical contexts although they have always formed the backbone of liturgical prayer. Moreover this limitation has a knock-on effect since it tends to influence the mood and ambience of worship. Statements begin to assume a more direct, explicit and even assertive quality, and the production of rhythmical prose becomes more difficult. These problems are further exacerbated by a marked tendency among contemporary liturgical translators to outlaw obsolescent words like the vocative ‘O’, UNTO, LO, BEHOLD, etc., thus narrowing one’s options especially in matters of rhythm and sentence construction. The literary quality of texts goes into decline. Another argument commonly urged in favour of traditional idiom is that in religious contexts, THEE and THOU have a spiritual quality which YOU does not. This is not (as some translators claim) a historical accident resulting from the disuse of the 2nd singular in everyday speech, for the distinctive religious THOU, with its own special overtones, can be traced back at least to pre-Reformation times. 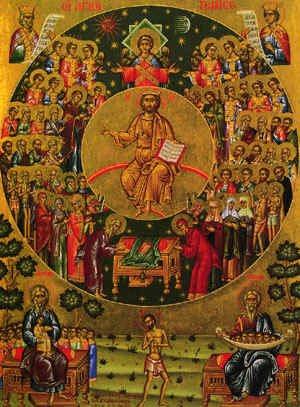 Thus by using contemporary idiom, it may be argued, we are depriving ourselves of a word which, perhaps more than any other word in the language, is capable of engendering awareness of those special qualities of transfigured life and visionary perception which it is the aim of the Liturgy to cultivate. Whether the special associations of THOU can survive the general disuse of the 2nd singular is of course another matter. However it seems to be widely valued at the moment, at any rate among older worshippers. One general point by way of conclusion. Although most people would surely agree that liturgical taste now requires something simpler than (say) Florence Hapgood and that a degree of textual revision was therefore necessary, it is possible to feel that the process has been too protracted and that it has spawned far too many variants. Crucial to the effectiveness of liturgical prayer is that words which are said or sung in church should sink into the memory so that they may be fed upon in the heart. ‘Ongoing’ textual revision hinders this process and is thus an impediment to the spiritual life. Different versions float around in the brain, get mixed up, create appalling tautologies (‘Behold I was conceived in sins and in sins hath my mother conceived me’) or just destroy each other like colliding electrons. Arguably what we now need is a period of stability and consolidation so that we may grow to love the sacred texts and allow them to transform us from within. Copyright © Deacon Ian Thompson, 2005, who read English at Durham University and taught for 34 years in a secondary school. He is now a part-time tutor with the WEA. First published in Vol 18 No 2 Winter 2005 of ORTHODOX NEWS, from St George Orthodox Information Service, U.K. Presentation and editorial emphasis by ORTHODOX CHRISTIAN COMMENT. We would like correspondence on this subject, which will be answered by the author: mailto:editor@orthodox-christian-comment.co.uk .